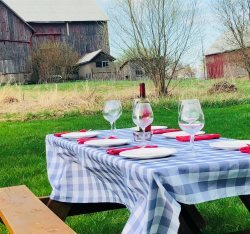 Comprised of Ameliasburgh ward in the west and Sophiasburgh in the east, North County is convenient for those wishing to enjoy a County experience close to the 401 corridor while enjoying farm stands, wineries, Campbell's apple orchard, great fishing and more. From the local County tourism site: "Ameliasburgh is the largest ward in The County and home to the villages of Consecon, Carrying Place, Rednersville, Rossmore and the village of Ameliasburgh Ameliasburgh is named after Princess Amelia, the 15th child of King George III. It meets the Bay of Quinte to the north, cradles Consecon Lake to the south and encompasses Roblin Lake a thriving hub in the 1800s thanks to a grist and flour mill that now lives at Black Creek Pioneer Village. As the first stop for anyone traveling from the west, youll cross the Murray Canal, an 8km waterway that disconnected The County from main-land Ontario in 1889. Ameliasburgh can also be reached via the Bay Bridge from Belleville. The area has no shortage of maple trees, studios and galleries, island shoreline, and historic significance to explore" "One of the three original townships that formed Prince Edward County in the late 1700s, Sophiasburgh (pronounced Sof-EYE-ahs-burgh) is bordered by the Bay of Quinte and connects to the Tyendinaga Mohawk Territory via the Skyway Bridge. County Road 49 is the straight-shot connection between The County and larger roadways to Kingston, Ottawa, Montral and Qubec try not to get distracted by the views of Picton Bay on your drive. Dotted with villages on Big Island, in Demorestville, Northport and surrounding Fish Lake, this area is thriving with farmers, musicians, shoreline resorts and entrepreneurs serving up everything local from wine, to jam, honey and even County-made kimchi."